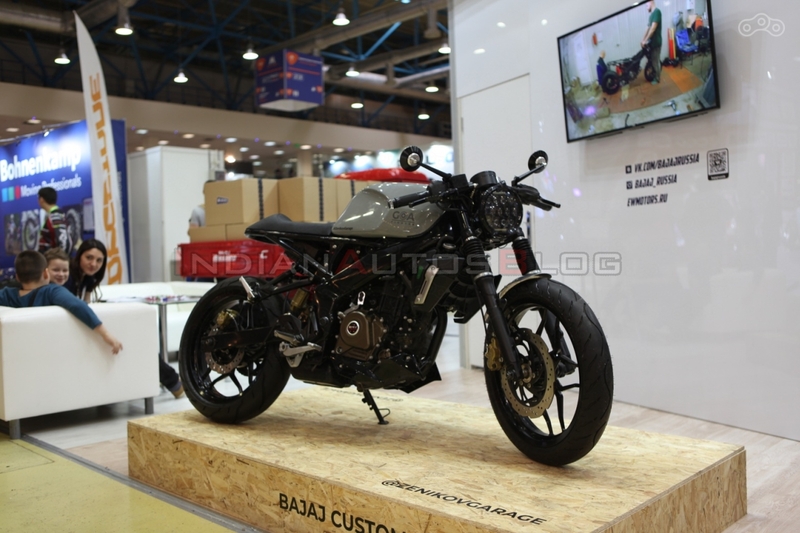 Russia’s Zenikov Garage showcased a heavily modified Bajaj Pulsar NS200 at Motovesna 2019, and the custom motorcycle carries the name of India’s party capital - Goa. Christened as the 'Goa Fighter', the custom Bajaj Pulsar NS200 gets cafe racer-like styling. The Bajaj Pulsar NS200 has received a complete overhaul with cafe racer styling. The fascia drops the modern design for a retro-style spherical headlight. The LED lighting adds a contemporary look to the cafe racer design, while the front forks gaiters enhance the old-school styling. Another visual change to the front of the motorcycle is a custom, short fender. The cockpit features a revised instrument console. The standard display has been traded for an analogue meter with an integrated digital screen. The tachometer is analogue while the rest of the information can be seen on the digital display. Steering duties, like on the stock motorcycle, are performed by a clip-on style handlebar, although the unit on the cafe racer is lower for a more committed riding stance. Bar-end installed front blinkers give the custom Pulsar NS200 a clean look. The custom motorcycle features retro-style round rear view mirrors with a dual-tone finish that adds a premium touch to the mod-job as well. A custom-built fuel tank follows the cockpit. The tank has a grey paint on the sides while the top features a black stripe that runs through the centre. The grey and black colours are divided by contrasting red stripes. Zenikov Garage has retained the flush-type filler cap on the cafe racer. The sides of the tank have recesses to lock in the knees while cornering or crouching at high speeds. The sub-frame has been modified to accommodate the custom seat. The saddle features vertical stitches and a cowl-style rear to enhance the cafe-racer look of the motorcycle. The stoplight and rear blinkers have been integrated into the rear frame for a clean look to the tail section. The standard engine cowl has been retained on the custom motorcycle. 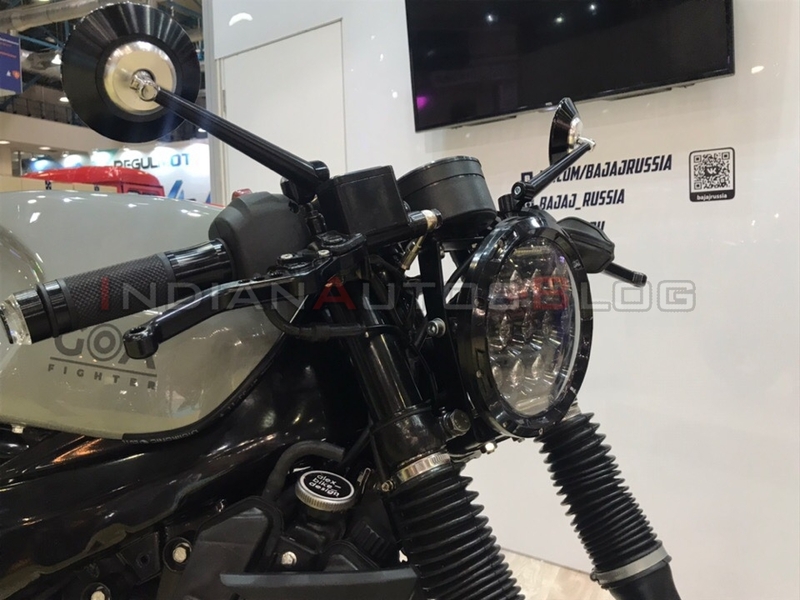 While the styling has been completely changed with aftermarket headlight and custom fuel tank, the hardware and engine specifications of the custom Bajaj Pulsar NS200 have remained unchanged. While the bodywork has received a complete overhaul, the hardware specifications are identical to the stock motorcycle. The suspension duties are performed by telescopic forks with anti-friction bush at the front and Nitrox mono shock absorber with Canister at the back. Braking setup retains the 280 mm wave pattern disc at the front and 230 mm wave pattern disc at the rear. Wire-spoke wheels in place of the stock alloy wheels would have made the cafe racer look even more desirable. The exhaust outlet is seen in the stock position, and there are no changes visible on the engine. Thus, the custom motorcycle most definitely retains the 199.5 cc, SOHC 4-Valve, liquid cooled, Triple Spark, DTS-i motor that delivers 23.5 PS at 9,500 rpm and 18.3 Nm at 8,000 rpm.